The Innokin Endura coil heads contain a 2.0ohm dual coil array which results in excellent vapor production and an organic Japanese cotton wick for a great flavor vape. It is recommended you replace your coil heads every 2 to 4 weeks for optimal performance. Not the coils you're looking for? Shop our full range of Innokin coils here! 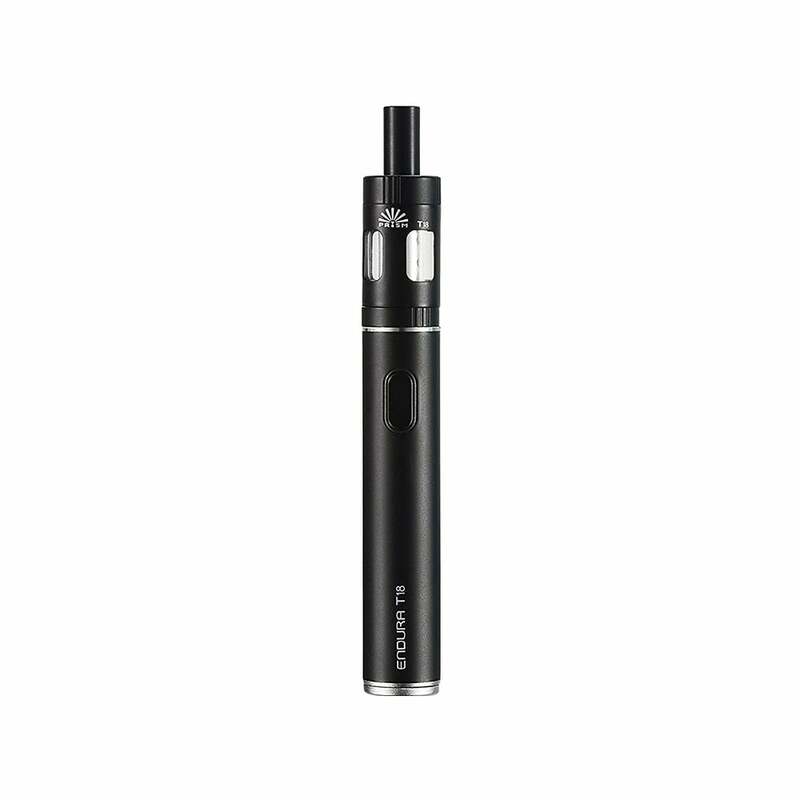 The Innokin Endura T18 is a slim, easy-to-use vape pen starter kit that’s ideal for beginners. The Endura T18 delivers a great mouth-to-lung experience, giving you a draw that’s very similar to that of a traditional cigarette alongside incredible flavor. The Innokin Endura T18 comes with all the hardware you need to start vaping; just fill the 2.5ml Prism T18 tank with your vape juice of choice and you’re ready to go! Your Endura T18 can be filled quickly and easily by unscrewing the top cap and dripping your juice down the side of the tank. The Prism T18 tank included with the Endura T18 is made from high-quality stainless steel and Pyrex for durability. The 1000mAh battery included in your Innokin Endura T18 should last most vapers a full day, depending on usage, and features built-in overheating protection, over-discharge protection, a 15-second cut-off and a range of other safety protections. You can charge the battery using the Micro USB cable included with the kit; you can even use the device while charging thanks to its pass-through technology. The T18 is optimized for perfect performance at 14W, and takes 1.5ohm coils with organic Japanese cotton wicking for outstanding flavor. Thanks to these coils, the Endura T18 works with juices with up to 60% VG, which is rare for a vape pen kit! Innokin’s Endura T18 is a fantastic vape pen for newcomers to vaping, but its durability, powerful flavor and perfectly optimized draw also make it a great choice for more experienced mouth-to-lung vapers. I have had 3 T18’s, a T22, a T18 II and a T20. NOTHING beats the ease of use, longevity of the devices, the flavor they produce, or the price for a MTL vape. Personally, I would rate them in the order I listed them, but I have nothing negative to say about any of these devices, they are Amazing and I have tried many, many different brands. Within 3 days of use the charging light would stay “orange” and never go off...despite recharging. This happened to BOTH of the units I purchased. Not sure what the issue is but certainly a waste of money. Product was nicely packaged and seemed to be well made. Omg. This is the best. Just like a drag of a real cigarette!! And it’s pretty. Nightly recommend this product!!! Not bad for a simple all in one kit. I have had some issues with leakage around the bottom of the tank. Unit does hit well but the coils don't last very long at all, find myself changing them about once a week but this is probably because of my level of usage. USB charging passthrough is a nice feature, this used to not be so easy to find on devices. I absolutely LOVE my Endura T18!!! I'm new to vaping and was very skeptical. I thought I would wean off cigarettes slowly but I stopped after just 2 days with my new vape!. 10 days now without a cigarette!!! I don't even miss them. Great device. I switched to this from a juul and couldn't be more satisfied! This product fits my needs perfectly. I had vaped for a few years, but found myself smoking again so now that I am back to vaping, I am ecstatic to find this little device. I like the excellent mouth to lung hits it gives and it's simplicity. I have a couple mods and a couple RTA's lying around, but I just wasn't a fan. I'm not a cloud chaser looking to fill the room, but this gives me a good amount of vapor and excellent flavor without the bulky heavy battery I was constantly dropping. I just purchased my second because when I'm at work I take only a couple breaks, so I like to keep higher Nic juices in one and lower Nic juices in another for when I chain puff at home. It also allows me to have another on the charger because, as I just mentioned, I chain puff at home and will go through the battery within several hours. It's an inexpensive good quality device and the manufacturer throws in a spare coil, extra O rings, a couple extra drip tips and even a convenient plastic stand. How awesome is that? I would recommend this to any newbie vapor or seasoned vapor who appreciates a good mouth to lung hit. Very Pleased! Easy to fill. Great flavor. I use nicotine salts for the most part. Would order a second but I have to many vapes already, but I don't think you can go wrong with this one. It will break to glass if you drop it and it hits the right way, but i bought replacement tank for very little. Now I just don't drop it. Problem solved :). First time customer. I have used this model for a bit. When i purchased, it lasted about 4 days and then the charger light stayed orange and would not work. I googled this web site and this model was cheaper in this website, so i ordered. I just figured it was too much trouble to return or contact. I love this model. I think mine was defective. Just wasted money. Love it! Easy fill, long charge. First time vaping, started with store brand e cigs and it just wasn't enough. I have had this for a few weeks now and it's easy to use and refill. So far, so good. Elegant device. Love it. Just don't drop it on concrete. My husband broke the first one. We had to have another and I'm buying a spare. Another friend has dropped hers plenty of times with no damage. Take care of your Endura and enjoy! So far so good. I am new to the gaping so it beats the gas station kind. Has a good draw and a decent size tank. Only drawback is battery life, you have to turn it off when not in use. I bought this after the whole Vuse Vibe recall/bs. I had been so happy with the Vibe. I had gone back to the Blu cartridge system but that was proving LESS than cost effective. I did my research on this product and thought it seemed perfect for my needs. Plus it came with a free bottle of juice. Win/win situation. Ive been using this for a month now and cant believe how cost effective this is!! A bottle of the juice lasts me 2 1/2 weeks...thats only $14.95. I cant recommend this product enough!!!! VERY SATISFIED with this product!! Very pleased. Easy to use. Reasonably priced. Comes with extra set of gaskets for future use. Will leak if not screwed together snug enough but over all very happy, (only happened once and now I know). Also best to keep upright if possible; do not overfill. Comes with a stand. Awesome product! I bought this for my wife who has struggled with quiting smoking for years. This is a great device for that. My wife worked her way down on the nicotine levels and now has quit smoking and vaping. It’s a great vape pen. Really works well. Perfect, just what I was looking for. Simple fill and use design. Alot of vapor, but it's almost exactly like a cigarette. And so far so good maybe I can really quit smoking. Fast shipment and free oil, can't really ask for more with this one.